First thing’s first: People bet on baseball less than any other sport. It’s a simple fact and has been known for decades now. While it may be America’s pastime, it’s just not a very fast-moving sport and things can become stale very quickly when people tune into MLB games. And while there’s no shortage of fans, people generally enjoy rooting for their teams casually – and not just to cash in on them through baseball betting. From a betting standpoint though, a big reason for people not betting as much is most likely because some don’t clearly understand how the odds and wager types work for baseball betting. With other sports like basketball and football there is a lot more scoring so that a point spread can be used with those games, similar to a handicap in golf. Because scoring in baseball is relatively lower, books generally use a small, fixed point spread – also known as a run line. Sportsbooks also offer Moneyline, Dime Line and as mentioned previously, Run Line bets. If you need a list of the best sportsbooks to bet MLB at, you’ve definitely come to the right place. Utilizing these types of bets and parlaying that knowledge into cash is important when it comes to betting on baseball, and being informed of the different types and knowing there are can come in handy when the games get underway. Since there are no point spreads in baseball, the method that is used for adjusting for favorites and underdogs is called a Money Line. The expression of Money Lines is in terms of a dollar. So if you bet on a team that is the favorite to win you will have to bet more than one dollar to win one dollar. You will notice that betting lines in baseball are shown as a dollar with cents. The decimal point may be used or it may not be used, the point is the same. As an example, if you wanted to bet on a team that was the favorite, the line might look like Yankees -140 against the Rangers +140. In this case you would have to bet $140 to win $100 if you bet on the favored Yankees. Now if you were going to be betting on the underdog (ex: the Rangers in this example) then betting $100 would actually yield a profit of $140. This applies for every dollar amount and not just in increments of $100 – as most sportsbooks will allow you to bet as low as a dollar (sometimes LESS). >> Need more info? Check out this refreshing article on Money Line Betting in general. People normally choose money line bets when betting MLB and other baseball games because it takes out a lot of the stress of rooting for a single team to win by a certain amount of runs. Since most run lines are set at 1.5, it’s pretty standard for most bettors to just choose a team they think will win their game straight up – meaning if they win by 1 run or 10 runs, they’ll still get paid out. Most times, games are of often won and decided in the last 2 to 3 innings, and for that reason a lot of favorites will normally NOT cover the Run Line in such close games. Looking for a sportsbook that offers a Dime Line is going to be very important to you over the long run. Very simply put a Dime Line is what the difference will be between the favorite and the underdog in baseball betting. For example if the Favorite is at -1.40 then the underdog will be at +1.30, only a .10 difference, hence the Dime Line. Some books offer a Wide Line or a .20 line and in this case, using the example above, the favorite would be -1.40 and the underdog would be +1.20. Still other books use a Graduated Line where the spread between the lines is different based upon how much one team is favored. So as an example a favorite could be at -1.15 and the underdog would be -1.05 but if the favorite was -1.70 the underdog would be +1.50, so the difference would be greater. Dime lines can also show as whole numbers at most books, such as -191 or -107 for certain favorites. A pitcher is one of the most important positions on a team. He is involved in every play and is the biggest variable between one game and another. Because of this there are different kinds of baseball bets based upon the pitchers. A Listed Pitcher bet is made on a game that has two starting pitcher listed. If both of those pitchers do not start the game then there is no action and the bet is refunded. Starting the game for a pitcher is considered to be just throwing the first pitch for the team. A Specify Team Pitcher baseball bet is when you place a bet on a team and only specify the starting pitcher for the team you are betting on rather than for both teams. As long as the pitcher listed to start for the team you are betting on starts the game, you have action and the bet stands. Whether or not the listed pitcher for the opposing teams starts or not does not affect your action. Team action is when you bet on a team with normal action. In this case the bet is good whether or not there are changes for either team in the listed starting pitchers, although the odds may be adjusted. And there is also a team action against listed pitcher baseball bet. In this type of a bet it does not matter if the listed pitcher for the team you bet on starts but if the listed starting pitcher for the opposing team does not start then the action if voided and your bet is refunded. Two of the more popular types of baseball bets are Totals and Run Line wagers. A Totals bet is just like basketball or football. The total that is referred to is the number or runs scored by both teams combined by the conclusion of the game. Just as overtime scores are included in Football and Basketball Totals, runs scored in extra innings are also included in the Totals. Totals bets require that both listed starting pitchers start or the action is voided and bets are refunded. Run Line bets are simply point spreads. A Run Line of -1 ½ means that the team that you bet on must win by 2 runs. On a Run Line Bet both listed pitchers must start and the game must not be called early or the action is voided and the bet is refunded. 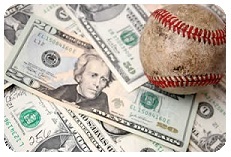 >> Here is a great article on MLB Run Line Betting in case you need a refresher.